The castle was built in the late 13th century and, like many of the castles in the region, it played a key role during the Hundred Years War, and later in the Wars of Religion. At the beginning of the Hundred Years War, it formed the border between France and England; as a result, it changed hands several times during the war between French and English. The castle was destroyed towards the end of the war but it was rebuilt by Radulphe de Saint-Clar in 1450. During the Wars of Religion, it was used as a base for the fight against the Protestants. Again it changed hands, this time between Catholics and Protestants, and it was left damaged at the end of the war. A great dispute for the castle took place at the end of the 17th century; Jean de Saint-Clar and his sister Suzanne argued for nearly 40 years about the ownership. Suzanne eventually won. 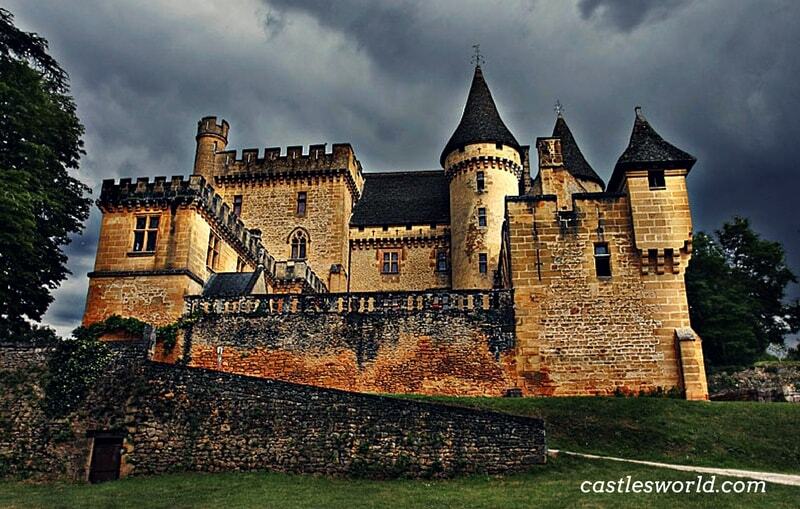 At the time of the French Revolution, the castle's new owner was imprisoned and the chateau was abandoned. The family of the present owners took control of the castle in the 19th century. 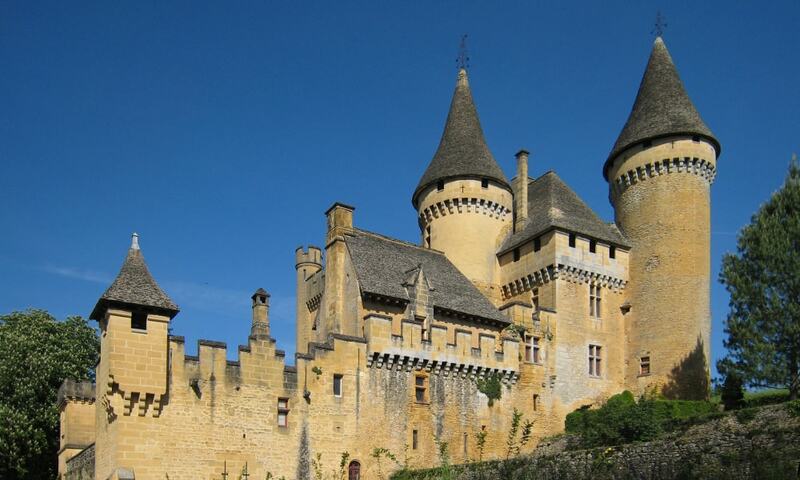 They undertook major restorations which substantially modified the appearance of the chateau. Today, the castle has a neo-gothic appearance and it is open to the public. The interior is decorated with well-preserved fine furniture, tapestries, and paintings. The mythology theme is displayed in many of its rooms and it is also continued in the large hall. There is a legend that the ghost of a young lady dressed in white sometimes appears in the castle. In the 16th century, Therese de Saint Clar was surprised by her husband on his return from war in the arms of her lover. She was imprisoned in a small room in the tower, never to leave it before her death. Food was passed through a trapdoor in the ceiling until the end of her life, which took 15 years. After her death, she was walled in the same room. Today, she is known as The White Lady (La Dame Blanche) and, according to the legend, you can sometimes see her wandering at night.